Discussion in 'The Sound Hound Lounge' started by Serenity, May 8, 2016. Missed this when it was released a couple of months back. This album is killer and i've had it on repeat most of the weekend. Surprised it hasn't already been mentioned on TGP. 27sauce, Grainslayer, tabb74 and 5 others like this. Serenity and bullet6759 like this. No idea they had a new album. That posted version of them doing Dark Energy kicks. I actually like it better than the CD version. When I saw them a couple of months ago, they opened the show with Dark Energy. Very powerfull song. Normally I rush out for new Cult but that last album was a real letdown. I'll grab this one eventually. It's much better than the previous release. Kinda has every era of The Cult wrapped in one album. I've seen the Cult four times. Billy Duffy is amazing live, serious chops. I believe he is one of the last of a dying breed- the British guitar god. Still need to check out the new album. Thats John Tempesta on drums, he was in Testament and White Zombie. bullet6759, grind1 and Serenity like this. I love Electric. I wore the grooves out on that bad boy back in the day. evanjackson and Oldschool59 like this. Love, Electric, Two great albums. Love and Electric are essential, IMO. Beyond Good and Evil is a pretty good one too, Bob Rock produced, Matt Sorum on drums. Its circa 2000, 2001, so they were into the drop tuned sorta Godsmack sounding riffs but I think there's some great tunes on that album. grind1 and Heinz57Pep like this. Sounds good, I try to pick it up this weekend. I love the self titled one on top of the ones already mentioned. 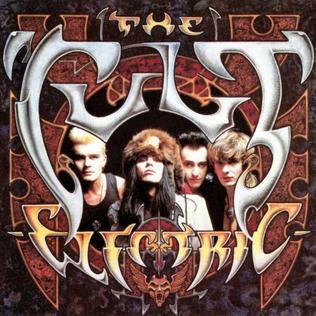 The Cult have changed their sound a few times over their career, so with Sonic Temple as your point of reference, you may or may not be disappointed in some of the other 'eras'. Most similar in production to Sonic Temple is Ceremony. However, it's not one of my favorites. It comes across as an attempt to reformulate the success of Sonic Temple, but the songs are not as strong. Not recommended (at least not until you check out some of their other stuff). Electric is more straight-ahead musically than ST, and many compare it to AC/DC. However, IMO Electric is saved from being big dumb c**k rock by it's lyrics. That's not to say that they are especially deep, but it's not your typical 80's...stuff. I would recommend to you. Going back to their first two albums, you will find their sound is quite different, but pretty awesome (IMO). Both Dreamtime and Love are Goth/Post-Punk/Psych affairs. Love is the more refined of the two, with some Pop savvy added to the mix. I would recommend Love first, then reach back to Dreamtime if you liked Love. Going the other direction, you'd come next to The Cult. You can tell they paid attention to early nineties (Grunge, if you like), as it influences the sound here. It starts to get a little angry at times, in a way unlike anything they'd done prior. Recommended. If your still interested after checking out the albums above, I'd skip the next couple and go to Choice of Weapon and Hidden City, in that order. bullet6759 and Dr. Tweedbucket like this. Thanks for taking the time to map it out .... I'll certainly enjoy Electric I'm sure and then probably the grunge stuff next. I've heard tracks on the radio and knew it was them but the DJ never announced the song or what album ... so I know there is a lot more good untapped material out there. This album is great front to back. Criminally overlooked in my opinion. The guitar tones and riffs are on the heavier, more modern side, but that doesn't necessarily signify any Nu-Metal leanings to me. Considering the time period this was released and the potential for them descending into a 7-string, Jnco panted nightmare, they kept it cool and did what they do best. The delay-laden melodies are still there and so are Ian's vocal hooks, but the elevated and more aggressive rhythm guitar roar adds a neat dimension. Keep Dreamtime and Love in mind as well. menlow and JeffK like this. I'll echo the Beyond Good and Evil praise and disagree with the Ceremony criticism; both are very underrated in the Cult catalog. Dreamtime/Love and Sonic Temple/Ceremony are the only times when the Cult sounded like the same band on consecutive releases (Choice of Weapon/Hidden City is close). Being all over the map stylistically probably didn't do them any favors in terms of being seen as the best band of the last 30 years, but their music has consistently been interesting and of high quality. bullet6759, rnm14, menlow and 2 others like this. Check out the "Peace" version of "Electric". Most of the same songs but with Steve Brown (Love's producer). As known as "The Manor Sessions", the Peace versions of the songs are far and away better than the AC/DC wannabe "Electric" versions. The Live Cult - Marquee London MCMXCI album is phenomenal too. Billy Duffy is absolutely on fire.